I did not own a console. Consider my total surprise then, when I decided to buy an Xbox One, got Destiny as a free game, and fell hard for the game which had just begun its second year. I truly believed that Destiny would just be a game I messed around with until newer games and backwards compatibility arrived. Now it seems that I may favor Destiny over anything else that may be available in the near future. How did this happen? Apparently when I started the game back in September, a lot had already changed and because of these changes, the game was better than it was in Year One. That worked for me as it is the only version of the game I knew. The Taken King had just come out, but I doubted that I would like the game enough to buy the expansion, let alone all of the DLC it required. So there I was, leveling my Warlock (Blind class pick by the way. I had no idea.) I got him up to around level 14 when I discovered The Crucible. Up until that point, PVE questing was OK, but there was not much there to keep me engaged. As I began PVP, I discovered a whole new game. Destiny, it turns out, is a very fun and satisfying multiplayer FPS with quality map design and game modes. What really sealed the deal for me was when I realized I was gaining the same, if not more XP toward leveling than PVE and the loot rewards at the end of each match seemed much more valuable to me than PVE as well. It was not long after that I plunked down the cash to buy all the DLC and The Taken King in one fell swoop. What was most important was that this opened up all of the multiplayer modes including Rift, Salvage, and my current favorite, Mayhem Clash. It has been roughly 2 months and I am doing Crucible bounties almost everyday. I started a clan and almost have light level 290, which I hear is recommended for raiding. I am PVP focused but my friends and I will do a daily heroic story or even Nightfall on hard once in a while along with the occasional quest. I rely on PVE to break up any PVP frustrations or monotony. Right now, it is a good mix. The game plays very well. The control feels very good for an FPS. The game does a great job with loot. There is always an item to chase or a way to upgrade what you already have and this happens often. Destiny has been spiced up during the time I have been in game. It has been kept fresh. One weekend was an Iron Banner event (Which I excitedly earned rank 5 in). We are currently in a Halloween event (Festival of the Lost). And I hear that an arena event is just around the corner. Amazing things happen in multiplayer. This is important for any cornerstone game. I have so many clips of cool stuff happening in Destiny. Part of the reason I play is to be a part of that, whether it is a last minute miracle win or performing an amazing last second denial in Rift (See video). Right now Destiny is my game of choice. I still find time to sprinkle in a little bit of Hearthstone though. Who would have thought that a year old game that I got for free would be one of my favorite games of this year?! Warlords of Draenor launches tomorrow. More than any other World of Warcraft expansion, I feel a question mark as to how this expansion will be received because there seems to be a lot riding on it. On paper, it looks like it will be a top notch offering. Many of my friends never truly liked Pandaria as an idea, but we all played it because it was very high quality and very well made. Luckily, the core of the game was not lost among the cartoony pandas. Looking back on the MoP expansion has me a bit torn. On one hand I initially loved it for the quality of design, music, and changes to game systems. On the other hand, it is safe to say that Pandaria is my least favorite WoW expansion (It is the only World of Warcraft product that I refused to buy the Collector's Edition for). I was always opposed to and turned off by the Pandarian concept. The whole idea of taking an April Fool's joke and turning it into a playable race and story within the game still seems a touch silly to me especially when there were so many other great races that could have been chosen. I know Blizzard had their reasons and you can see what they were going for, but ultimately, it is clear that fans want WoW back to its roots and that is exactly what it seems Blizzard is doing with WoD. WoD will bring us back to a world which we know, to an extent. Also it is a world in which many players enjoyed their stay. Yes, bring us back to Outland even if it is a different version of it. It will bring back the war. Pandaria was a bit light-hearted and philosophical. 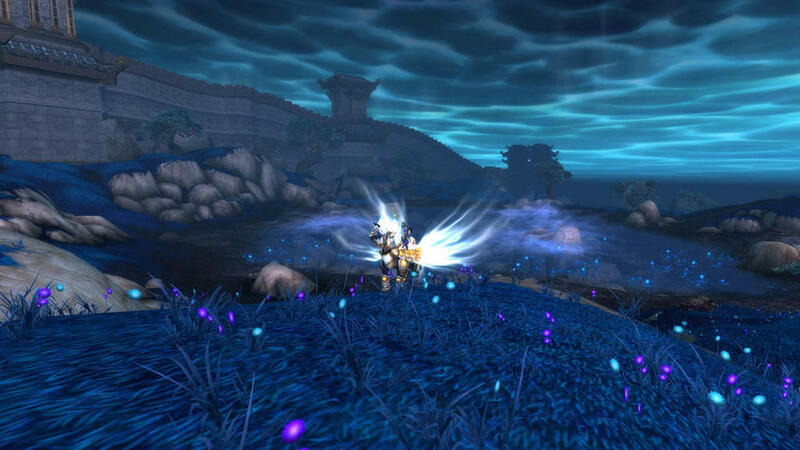 WoD, at its core, is about hunkering down and preparing for war. Its main selling point, Garrisons, is exactly that. So here we stand on the edge of the end of Pandaria and on the brink of Warlords of Draenor. WoD holds so much promise and hope for many players. Mix that with updated holiday events and the 10th Anniversary celebrations and this game is poised to keep me away from all other video games for the rest of the year. I'm not complaining about it either. So clear your quest log and read that guide about Garrisons. Also fire up this Warlords of Draenor inspired playlist I created on Rdio as a companion to doing battle. I have been around for several console launches. Based on my last console launch purchases, one might mistake me for an Xbox fanboy. As I have grown older, I have become more discerning as a consumer. ‘Shiny and new’ is no longer good enough to guarantee that my wads of cash will flow through the system, at least on Day One. We have come to learn that it is a near foregone conclusion that most things that require online services during a large scale launch will fail on some level for some customers on Day One. This was certainly the case last night for some new PS4 owners and I am sure some Xbox One customers will not be lucky enough to go completely unscathed in some fashion next week. With these two new consoles, the PS4 and Xbox One, there really is no single system selling game, at least for my money. Everything is a mishmash of games available on PC, previous generation consoles (Call of Duty, Battlefield), or just standard launch title fare (Knack, Ryse). If Ryse ends up being a 10 out of 10 classic, I will have no problem eating my words. Take away shiny, new, and fanboyism and I do not see any compelling reason to slam down my hard earned cash for either system. It is then not surprising, the move I made this week. I took the money I had set aside for the console launch (read: Xbox One pre-order) and diverted it to a much needed gaming PC upgrade. This is the first time I ever changed direction so quickly, decisively, and so late in the game at a console launch, but I have to admit it was an easy decision considering the facts, or lack thereof. Fact 1. Microsoft has been very mum, to a fault, about sharing information and specific details about its new console. So much so, that I could not tell you if I would be happy with it out of the box or not. I suspect I might, but too many questions were left unanswered. Some answers have been found, but most of them were not available on Microsoft's own website. I guess no one really cares about the IR Blaster's full capabilities? Microsoft could really benefit from writing up an Ultimate FAQ like Sony did. Instead, Microsoft has slowly trickled out tidbits here and there in videos. Why the holding back of such vital details? Fact 2. What game is actually worth playing on either console? Resogun? And on the Xbox side, take into consideration the resolution limitations for the currently available titles. Is that really next gen? Sure, games still probably looks impressive, but there is something about knowing a game is running at 720p and wondering why I would not just play it on a 360 or PC. A few extra textures? At this point, I expect each generation to be magical somehow. It needs to wow me (Saying "Xbox on" is not enough), or what would be the point for the next 8-10 years? Regardless, it is tough finding the point on Day One this go around. Fact 3. I have spent the most money on games this year via Steam. The biggest reason for this is that Steam has ridiculous sales that save gamers tons of cash. In addition, halfway through the year, I stopped buying things on the Xbox Live Marketplace knowing I would not be able to carry my library forward to the ‘One’. You will notice an Xbox Marketplace launch game Powerstar Golf that is retailing for $20. I cannot tell you if this game will be worth $20. I also cannot tell you how much value that $20 will give me in a couple weeks during the Steam Sale, but I can venture to guess I will be able to buy at least 5 “known great” games that I actually want. With these ideas in mind, I could not come up with a good reason to justify buying either console on Day One. The PS4 was a longshot from the beginning and looking at its unorganized UI (I am certain a 'sort by' feature will be added to the games list in a future update), I could not imagine myself using it as is. I am sure I will eventually get an Xbox One (unless Titanfall underwhelms, although playing Titanfall on PC is always a viable option). So I wonder, what could have all but assured that myself and other people like me would have plunked down the cash for something shiny and new on Day One this year? 2. The proper and detailed divulging of details that would allow consumers to make an informed decision on an unknown and unproven piece of hardware. I had to scour the internet to find answers to my questions and some of them are still remain answered. 3. Better launch titles. Everything that seemed remotely interesting to me will not be available until at least next year. Watchdogs, Titanfall, Thief, The Division, etc., ad nauseam. Both consoles appear to have a somewhat bright future, but for now, I am absolutely convinced that I am not missing out on anything... yet. In my small group of friends, I am the only one playing World of Warcraft's latest expansion, Mists of Pandaria. Everyone else is either not interested or lacks the necessary time. These are people who have all played WoW in the past and conquered all previous expansions alongside me. The part of not having the time is based heavily around being older and being recovering MMO addicts in addition to an interest in trying to not get sucked into just one game. The part about not being interested revolves somewhat around the idea that pandas are corny and I imagine this is not uncommon. I feel sentiments of both of those ideas to an extent. Time is a precious commodity for everyone and an MMO requires more time than most other types of games. Beyond that, I was never excited to see pandas in WoW. I was content seeing them on the WoW homepage during April Fool's Day as a joke, but it ended there. I purchased Mists of Pandaria differently than any other World of Warcraft game in the past: Alone, online, basic version, no fanfare, and almost in an obligatory fashion. I thought about ending WoW altogether or trying a different MMO instead, maybe Guild Wars 2. But I already knew the outcome of that choice. I would buy Guild Wars 2 and get bored of it then buy Mists of Pandaria. So I just purchased MoP and dove in on day one. I did not have terribly high expectations. I actually presumed I would not like it. It is now a month after release and I have not stopped playing. Mists of Pandaria is truly a return to form and then some. It is so much more than anything Blizzard has ever done with WoW. Over the last several years Blizzard has changed, tweaked, added, and deleted so many features and systems that it almost seems precisely planned that MoP is some sort of grand culmination and maturing of all previous changes. This expansion could not be what it is without the maturity of the Dungeon Finder and Raid Finder. Both were evolutions of the idea of solving the issues of getting people into dungeons quickly by grouping them automatically and allowing them to join these instances from wherever they were in the world and took away the need to be on the same server. These systems also place players nice and neatly back to what they were doing before the encounter. It did not always work that way. Now, it is another facet of the game that is expected and it just works. There are several new dungeons to conquer. My preferred method is to queue up for 1 or 2 dungeons per day as I am leveling. This gives some quick XP boosts in addition to adding some blue gear to help leveling even more. It is not necessary to do this by any means as many quests offer hearty gear upgrades as well, blues included. These new dungeons are straight up, "to the point" with the least amount of trash mobs as ever before. At level 90, with an average item level of at least 450, players can begin heroic dungeons which offer slightly greater challenges and slightly better loot. One of the best tests of a dungeon's staying power is whether or not you mind returning to its heroic version for numerous subsequent runs. In Cataclysm for instance, I was never thrilled about going into Grim Batol Heroic due to its longer duration than other dungeons. It sometimes felt tedious. None of the new dungeons feel this way to me in MoP. Completing your gear drops from heroics will lead you to getting your average item level to 460 for raids and so on (470 for further raiding). Just last night I was able to hop into a Raidfinder version of Mogu'shan Vaults for the final boss encounter. It is a similar experience to the Raid Finder content in Cataclysm except you win your own loot instead of rolling against the whole raid which is a welcome change. This game feels like it was directly tuned from all of my previous positive and negative expansion experiences. Leveling feels just right. Leveling is made up of standard WoW questing fare: Collection quests, kill quests, and an occasional bombing run. Every once in a while a quest might stand out and make you smile like the one featuring Master Bruise Paw in Paoquan Hollow which plays like mix of Karate Kid and Kill Bill training. More care has been taken to make sure multiple quests happen closer together so it is easier to stay more organized and productive. Once an entire quest hub is completed, you are offered a ride to the next one. This helps to keep up with the natural questing progression if you so choose to follow it. The star of this expansion though, is the game world. The zones are some of the best that have been crafted in any MMO I have ever played. The zones are vast, beautiful, detailed and made with care. Each area is memorable which means the designs were well thought out. Even though I do not care for pandas, their home world is fleshed out with ridiculous amounts of culture and story. It is difficult to not be pulled into it and care a little. Blizzard has created an entire continent that I actually want to spend a lot of time on. Whether it be a rainy afternoon by the Lake of Stars or a bright sunny morning near the Great Wall, the world is a true marvel to behold. As a testament to the vast beautiful continent, I never fly too far from the ground so I do not miss any of the character or charm. This appreciation for the new zones could only facilitated by the inability to fly until you are level 90. At first I was frustrated to learn that the ability to fly had been taken away yet again as I began my journey, but as I experienced the game from ground mounts only, I understood why flying was taken away and I did not mind. I actually preferred it. I feel like I would have missed out on so much. It should be noted that I have been level 90 for about a week and I have been flying all over Pandaria and I still have not seen it all. Needless to say, the charm of exploration is more alive than ever in this expansion. The character progression options are nearly endless. Cooking has become more desirable and fun. This is a product of the happenings in and around Halfhill. Halfhill is a cooking hub that offers a plethora of things to do in the cooking profession. It certainly does not hurt that the new player farm feature is just across the field which integrates directly with cooking by allowing you to grow crops that are required by the newest recipes. In my experience, this area is a very popular place and only one piece of the huge progression puzzle MoP offers players. On a personal note, going into MoP, my cooking skill was a mere 82. Halfhill offers a helpful first for WoW professions: True power leveling for cooking. There are all new recipes with ingredients that can be purchased and found easily. I was able to level cooking to over 500 within a half hour. This is something totally new. Blizzard is telling players "We want you to experience what we have done with cooking and we want to make it easy for you to catch up". Every other profession has seen its level cap raised to 600 including the newest profession, Archaeology. Archaeology has seen some new lore groups added in Pandaria which means new artifacts to find and also a new system that allows players to trade in commonly found artifacts for goodies to help with the profession. With that, another profession that has seen great additions is fishing by way of The Anglers which is a group of fishermen, including Nat Pagle, in Pandaria who offer you more fishing dailies. Fishing is amazing in MoP. There are so many lakes and rivers to fish from and there are more fishing pools than ever. Not to mention, many of the new fish are used in man new cooking recipes. In the right MoP zone with the right background music playing (and possibly while it is raining in-game), fishing is peaceful and one of the most unique ways to immerse yourself in Pandaria. There are several factions to gain rep with which spans every department and corner of Pandaria. The rewards, as always, speak for themselves and many dailies intertwine in terms of giving Lesser Charms of Good Fortune as rewards which eventually yield Elder Charms that give you bonus rolls in raids (another new mechanic). There is an entire quest line that enables you to eventually obtain a Cloud Serpent mount, which I just recently started. If it is not apparent, MoP offers more of everything. There are also all new entire sets of achievements. So much to do, so little time. With all of this meaty content, there are a ton of things I have not even touched yet in my first month like: Battlegrounds, rated or otherwise. I only had time for one scenario so far. I did not touch Challenge Mode yet. I did not roll a monk or check out its starting zones. I only took a short amount of time to try out Pet Battles (level 5). On a personal note, I have always loved taking part in Brewfest and Hallow's End which happened back to back the last few weeks. And forget about making it out to the Darkmoon Faire anytime soon even though I need to hand some quests in. There is a lot to do and that is what players look for in an MMO. Reviewing an MMO is always a tough task. It took me a whole month to experience enough content to feel confident enough to write something substantial. One thing that strikes me is that the game does not seem to be getting the attention I feel it deserves. The only way to describe how that makes me feel is this: I feel bad for anyone who decided not to pick this expansion up simply because anyone who was ever a WoW player at any time deserves an expansion this good. I know many will not come back to this 8 year old game for numerous reasons, but I think anyone who does not experience Pandaria is missing out on one fine MMO expansion (not just a Warcraft one) and none of that sentiment has anything to do with pandas except for the name. Bottom line: Anyone that has any kind of fire left for WoW should pick up this expansion. MoP sets the bar very high for future WoW expansions or any expansion for that matter. It is chock full of content and is well worth $40. Patch 5.1 is already on the PTR which will add even more things to do.